HA NOI (VNS) — About 510 Vietnamese health care workers have been selected for a special training programme to prepare them to work in Japan, the Overseas Labour Management Department has said. Japan's ageing population has stressed the country's health system and opened up opportunities for Vietnamese nurses and orderlies, according to the department. A nurse or orderly can earn about VND40 million (US$1,780) monthly in Japan. Candidates must be under 35 years old, graduated from nursing college or university and have two years of experience. Moreover, they need to earn a medical practicing certificate. The candidates take an apprenticeship programme in Japan for up to three years for nurses and four years for orderlies. Director of Kansai Techincal Cooperation Center, Kanemaru said that Japan faced the shortage of nusers and orderlies while in Viet Nam, graduates in this sector were unemployed or paid modestly, Ha Noi Moi (New Ha Noi) newspaper reported. 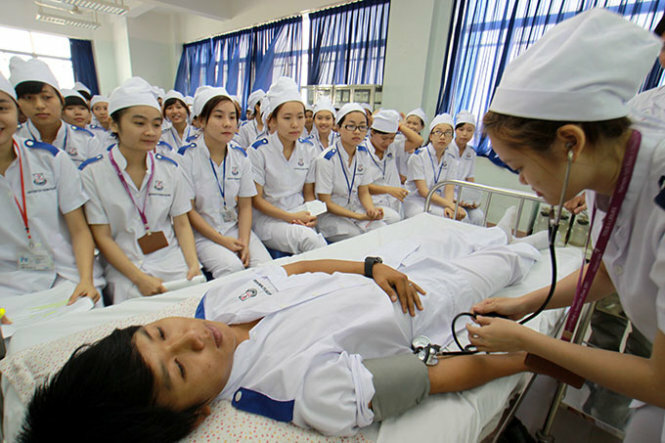 In HCM City, there are 27 medical schools with almost 14,000 students, of which, 3,530 students are trained to be nurses. Up to half of the students graduating from non-public medical schools are unemployed or do jobs that are not relevant to their expertise. Kanemaru said that Kansai wants good Vietnamese nurses and orderlies to work there. Kansai Techincal Cooperation Center – specialising in receiving and training overseas workers in the health care sector – has received over 3,000 Vietnamese and Chinese workers in the last 10 years. Japan additionally needs about 56,000 nurses and orderlies as the elderly makes up over 30 per cent of its population.